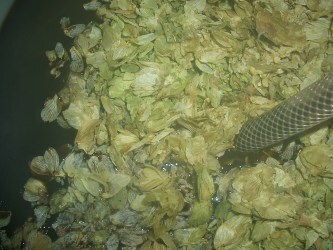 Did my fourth all grain brew yesterday, Four Shades of Stout, from a recipe off the jimsbeerkit.co.uk forums. I tried to treat the water with all the needed salts for a stout and did a 60 minute boil instead of the usual 90. This ended up giving me the correct volume but at a slightly lower gravity so I need to work on my mash efficiency or up the grain slightly. I also used Nottingham yeast for the first time - hopefully this will give the beer a slightly drier finish. Writeup of the brew day with lots of photos is now in the brewing section.